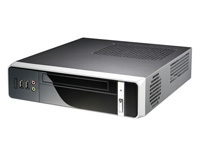 Versatile case with 120W power supply suitable for most Mini-ITX motherboards - Universal 110-240V operation. Identical specification to 8K01, with different front panel design. Steel frame construction with a solid black plastic front panel. Drive Bays: 1x 3.5in HDD; 1x Slimline Optical drive. Front Panel: 2x USB 2.0; Mic and Line Out; 1x eSATA; Power Switch and LED. Power supply: Internal 120W Universal 110/240V ATX Power Supply. Internal 12V P4 and 20pin ATX power connectors included, with 2x Molex, 1x SATA, 1x Floppy power connectors. Measurements: 70(H) x 268(W) x 318(D) mm. Volume: 5.97 litres. Supported boards: All Embedded (e.g. Atom, Celeron Bay Trail) Mini-ITX boards with ATX connectors; Socket Mini-ITX boards *only* with suitable low profile heatsink fitted such as Akasa 7106HP or K25 (Retail 35W TDP Intel CPUs come with suitable low profile heatsinks). Not supported: Socket AM2 boards with standard heatsinks, boards requiring over 120W power. Compatibility Notes: Additional IDE or SATA cable or adapter may be required if you are using a slimline optical drive, depending on the ports available on your choice of board. This case does not support PCI. Don't see what you want here? Send us an email with as much information as possible, and we'll try and get it for you.